Pete Seeger, the singer, folk-song collector and songwriter who spearheaded an American folk revival and spent a long career championing folk music as both a vital heritage and a catalyst for social change, died on Monday in Manhattan. He was 94. His death, at NewYork-Presbyterian Hospital, was confirmed by his grandson Kitama Cahill Jackson. 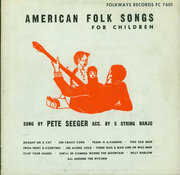 Mr. Seeger’s career carried him from singing at labor rallies to the Top 10, from college auditoriums to folk festivals, and from a conviction for contempt of Congress (after defying the House Un-American Activities Committee in the 1950s) to performing on the steps of the Lincoln Memorial at an inaugural concert for Barack Obama. For Mr. Seeger, folk music and a sense of community were inseparable, and where he saw a community, he saw the possibility of political action.